Anshan (or Anzan, Persian: انشان, modern: Tal-i Malyan) was an ancient town in what was then Elam empire (today's Iran) in the province Fars. The oldest settlement may have been as early as 5500 BC. 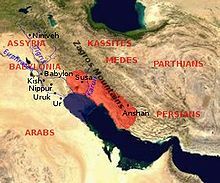 Anshan was later ruled by the Achaemenid dynasty and became one of the primary cities of the Persian empire. The Persian prince Teispes (675-640 BC) conquered the city and called himself "king of the city of Anshan"
Anshan is a big archaeological place today containing around 200 hectares. Excavations (digs) carried out by the University of Pennsylvania took place in 1971, 1972, 1974, 1976 and 1978. This page was last changed on 23 October 2016, at 11:18.